I came across this CNET article discussing the Apple MacBook Air’s release in 2010 and how the Sony Vaio X505 had actually beat it to the thin-and-light punch in 2004. Given Apple’s recently granted “wedge”Â patent for the MacBook Air, I thought it interesting to note that the Vaio X505 has a distinct wedge shape of its own, and clearly represents prior art. It also represents how Apple sometimes claims originality when they’re actually being quite derivative. So, Ultrabook makers, keep this in mind when Apple sues you because you’ve allegedly copied their design. And hopefully, the prior art will actually count for something this time. Update: I gave this a little more thought, and as is often the case, the situation is more complicated than it may seem at first glance. The biggest question here is, did Apple actually patent the wedge shape, or did they patent the specific design of the MacBook Air? Reading various stories around the Web, it would seem like Apple indeed patented the wedge, and thus many Ultrabooks would be infringing. If that’s what the patent covers, then indeed it would seem to be invalidated by Sony’s prior art (at least). If, on the other hand, Apple actually patented their overall industrial design (materials, port placement, color scheme, etc. ), then Sony’s prior art might not be a problem for the patent. But, in that case, it would seem that any other product would have to be much more substantially similar to the MacBook Air to be infringing. 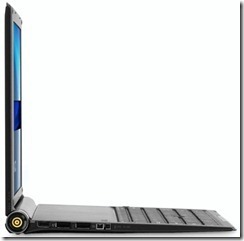 I believe in good old physics and when you look at the Sony X505, it clearly shows a wedge design. So in theory, Apple is the one infringing on this design. Apple does not want consumers to have a choice and we need to put a stop to that.